INX media case: P Chidambaram's son, Karti arrested by CBI at Chennai airport, taken to Delhi - Integration Through Media ....! 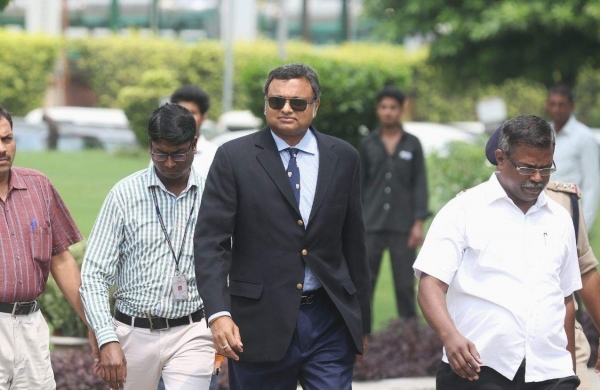 CHENNAI: Karti Chidambaram, son of former union finance minister P Chidambaram, was arrested by Central Bureau of Investigation (CBI) from the Chennai airport on his return from London this morning. According to the latest report, CBI team along with Karti Chidambaram has left for Delhi. Airport sources told Express that Karti Chidambaram was detained by the Immigration officials immediately after his arrival and taken into custody by Central Bureau of Investigation officials. “The flight, which came around 7.15am after which he was detained by immigration officials in Chennai airport,” airport sources said. It is learnt that he is likely to be flown from the airport to New Delhi. Meanwhile, a CBI spokesman from New Delhi confirmed that Karti has been arrested in the INX Media case. However, sources in the airport told Express that his luggage has been allowed to be taken to his residence. The arrest comes in the wake of Karti's chartered accountant S Bhaskararaman being arrested recently from a five-star hotel in New Delhi on February 16. Karti was initially denied permission to go to London as CBI feared he might escape from the investigations and finally he was allowed to travel by a high court.